Lawrence University is joining three other national liberal arts colleges in a collaborative effort to identify best practices in common core curricula and communicate the significant benefits of liberal education to a wider audience. Supported by a $243,000 grant from the New York City-based Teagle Foundation, Lawrence will partner with Pennsylvania’s Ursinus College, Tennessee’s Rhodes College and The College of the Holy Cross in Massachusetts to examine how core courses help students develop the judgment needed in their careers and in their lives. The 30-month-long project—“Gateways to Liberal Education”—aims to invigorate core curricula in American colleges. Beginning this summer, a series of four conferences will be conducted with faculty from each of the four schools to discuss ways in which a common course or syllabus identifies essential texts, skills and experiences that prepare students for fulfilling careers and lives as responsible citizens. The conferences also will explore benefits to faculty teaching such courses, how common inquiry can bond faculty and students and how colleges can assess their accomplishments. Subsequent conferences will be open to faculty from other schools interested in incorporating similar pedagogies and courses in their general education programs. The Gateways to Liberal Education project is expected to produce a volume of essays directed at both academia and prospective students and their parents that highlights the importance of this education model. The four-school consortium involved in the project each offer its own common core program. Lawrence’s multidisciplinary Freshman Studies program exposes students to enduring works in the humanities, fine arts, social and natural sciences to foster students’ abilities to think critically, write effectively and speak persuasively. Initiated in 1945, Freshman Studies spans two terms of a three-term academic year and strives to awaken first-year students to the excitement of liberal learning. Faculty from all disciplines teach the course in sections of approximately 15 students. 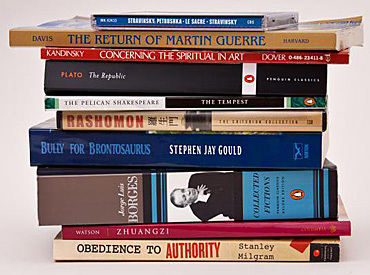 Ursinus, which will serve as the lead institution on the project, features the Common Intellectual Experience, a two-semester common syllabus core course required of all first-year students. The program uses texts to engage students in discussing three perennial questions: How should one live? What does it mean to be human? What is the universe and my place in it? Rhodes provides a comprehensive experience that links a rigorous academic program with experiential learning in the community. The college’s commitment to a values-based liberal arts education is based on 12 “foundation” requirements that emphasize students’ integrating their in-class work with research and experiential learning outside the classroom. Holy Cross’ Montserrat program enrolls all first-year students in small, intensive, full-year seminars that are grouped into five thematic clusters, each of which incorporates interdisciplinary and experiential learning opportunities through shared texts, lectures, field trips and other events. Each student is enrolled in a small, yearlong seminar that explores a specific topic while developing critical thinking, writing and communication skills. Joining Spurgin as Lawrence faculty representatives on the project are Elizabeth Carlson, associate professor of art history and Lori Hilt, assistant professor of psychology. The “Gateways to Liberal Education” grant aligns with The Teagle Foundation’s interest in seeking and supporting courses and programs that equip students to deal effectively with questions of meaning, value and responsibility that will persist throughout their lives. Founded in 1847, Lawrence University uniquely integrates a college of liberal arts and sciences with a nationally recognized conservatory of music, both devoted exclusively to undergraduate education. It was selected for inclusion in the Fiske Guide to Colleges 2013 and the book “Colleges That Change Lives: 40 Schools That Will Change the Way You Think About College.” Individualized learning, the development of multiple interests and community engagement are central to the Lawrence experience. Lawrence draws its 1,500 students from nearly every state and more than 50 countries. Follow Lawrence on Facebook. 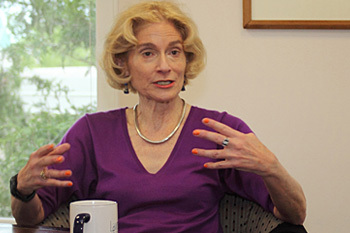 In her charge to the class of 2013 at Lawrence University’s 164th commencement June 9, honorary degree recipient Martha Nussbaum told the 289 graduating seniors liberal education is critically important in producing democratic citizens and urged them to become advocates for it. 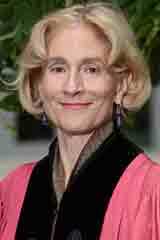 Martha Nussbaum, Ernst Freund Distinguished Service Professor of Law and Ethics at the University of Chicago. “What you can all do is to keep institutions like Lawrence strong,” said Nussbaum, the Ernst Freund Distinguished Service Professor of Law and Ethics at the University of Chicago. “You can also lobby with your local school board, your state and national representatives, for more attention to the liberal arts in public education at all levels. And, above all, just talk a lot about what matters to you about the education you’ve had here. Spread the word that what happens on this campus is not useless, but crucially relevant to the future of democracy in this nation and in the wider world. Martha Nussbaum received an honorary Doctor of Humane Letters degree at Lawrence’s 164th commencement. During a few visits to campus to visit a family friend’s son, who was a freshman at Lawrence this past academic year, Nussbaum sat in on several classes and came away impressed. “One was a political science class about American politics and another was an introductory econ class,” said Nussbaum, “and I just thought, ‘I want to stay here the whole semester to have this class!’ I’m just amazed at the way these teachers can combine sophistication with absolute clarity. These introductory courses that a freshman was taking were of course accessible to freshmen, they were very clear. But I was also stimulated. I was getting something out of the way the issues were presented. I just think they’re just so lucky to have that. 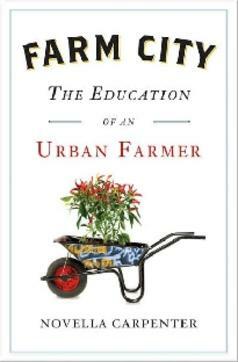 Taking a page from Freshman Studies, Green Roots is sponsoring a special 1-unit course for Term III under the umbrella of Topics in Environmental Studies that will feature a campus community read of the 2009 book “Farm City: The Education of an Urban Farmer.” The book’s author, Novella Carpenter, will visit campus in April in conjunction with Earth Day and the Fox Cities Book Festival. The book chronicles Carpenter’s efforts to operate a sustainable farm 10 blocks from the ghetto of downtown Oakland, Calif., utilizing a vacant lot to grow pumpkins and artichokes and the scraps in dumpsters to feed her collection of chickens, turkeys, ducks, rabbits and pigs. Registration for the one-hour-per-week, five-week-long class is currently open to all students and will feature 16 faculty from across the curriculum team-teaching the course with a colleague.